Montreal, September 9, 2018 – Alex Tagliani continued his quest to win his first-ever NASCAR Pinty’s driver title by finishing second in Round 11 of 13 of the 2018 schedule held Saturday night at Autodrome St. Eustache, located northwest of Montreal. Starting fourth on the grid, the Canadian driver ran a seesaw race going up and down the leaderboard of the Lucas Oil 250. Tag took the lead on lap 130 and led the next 76 laps until the 11th caution of the event. At the restart on lap 206, he found himself on the high side of the track losing the lead to Kevin Lacroix, before leading the next one. He then slipped down several positions. Next, he mounted a charge that led him near the front once again. Several full course yellows slowed down the rhythm of the race on the 0.4-mile oval and on the 12th and final caution near the end of event, a crash involving point’s leader LP Dumoulin and Kevin Lacroix forced NASCAR overtime. Fortunately, Tagliani navigated through the wreck and came out unscathed to finish second, his best ever showing in St. Eustache. Tag’s seventh podium finish of the season helped him close the championship gap to five points to leader LP Dumoulin who finished 10th. “We really had an amazing car tonight,” Tagliani said after the race. “This second place finish is really good for our championship aspirations because it seriously reduces the gap to the point’s leader. This is not an easy track to run on when you start the race on the outside lane. I was quickly overtaken, but I managed to rejoin the leaders. Then, someone rammed my Chevrolet Camaro EpiPen/RONA/St Hubert causing the alignment to be off and breaking my right side wheel hubs. I had to pit to repair. I lost several positions in the process. However, I managed to climb all the way to first place at the mid-point of the race. There is a lot of bumping and banging in this series and it’s easy to quickly lose positions. In fact, I made three comebacks tonight; the final one gave a second place finish. At the conclusion of the 257-lap affair, race winner Marc-Antoine Camirand crossed the finish line only 0.279 seconds ahead of Tagliani. Cole Powell was third ahead Kerry Micks. Racing 22 Team driver Donald Theetge finished fifth to give team owner Scott Steckly three cars in the top-five. Seventeen drivers started the race with 14 crossing the finish line. Eleven cars finished on the lead lap. The race was under full course caution 12 times for a total of 66 laps. This was Tagliani’s seventh top-three finish in 11 starts this year including a pair of wins, for a total of nine top-10 finishes. He also scored a pole position in Toronto to up his Pinty’s career total to nine. In 69 NASCAR Pinty’s Series career starts, Tagliani has eight wins, 30 top-fives and 47 top-ten finishes. The Lucas Oil 200 will air on TSN on Saturday, September 15 at 3:30 p.m. ET. In the driver’s championship, Tagliani is still second with 447 points. His second place finish, combined with LP Dumoulin’s 10th place in the race, helped him narrow the gap to only five points on the leader. It is now a two-horse race to the finish between TAG and LP. Up next in the NASCAR Pinty’s – New Hampshire Motor Speedway, Loudon, NH. The NASCAR Pinty’s Series will have a weekend off before its next scheduled race. The drivers will head across the American border for the first time in its history to compete in the Visit New Hampshire 100 on Saturday afternoon, September 22. Round 12 will be held on the 1.7 kilometre New Hampshire Motor Speedway in Loudon, NH. 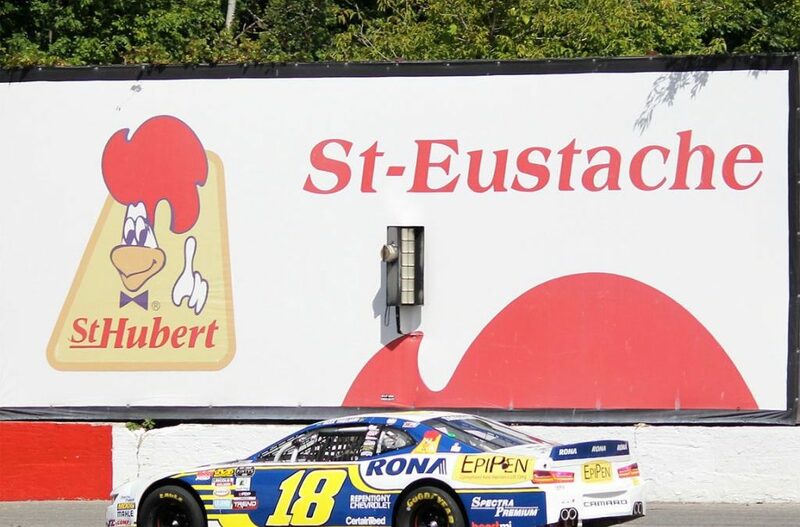 The Alex Tagliani Foundation donated a cheque in the amount of $1,500 to the Saint-Eustache Hospital Foundation during a RONA promotional day on Friday ahead of the NASCAR Pinty’s Series race at Autodrome Saint-Eustache. From left to right: Pierre Chartrand, member of the Notary Larocque Cabinet, Diane Lavallée, General Manager the Saint-Eustache Hospital Foundation, driver Alex Tagliani, Alan Labrosse, owner of l’Autodrome Saint-Eustache, Patrick McNeil, co-owner of restaurant St-Hubert in Saint-Eustache and Jacques Pelletier, Chairman of the Board of the Saint-Eustache Hospital Foundation.